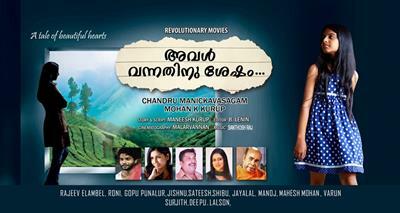 Aval Vannathinu Shesham malayalam movie will bring Harissa Begam as sole heroine. Debuted as a child artist in Asuaravithu, Harissa is gearing up for make a big appearance in Aval Vannathinu Shesham directed by Chandu Manickavasagam and Mohan K Kurup. She already had appeared in Turning Point and Face –to- Face. Her upcoming release will be Jayaram –starrer Ginger. Get ready to welcome yet another charming beauty who is gearing up to break the chords with making her vibrant presence as heroine. Debuted as a child artist in Asuaravithu, Harissa is gearing up for make a big appearance in Aval Vannathinu Shesham directed by Chandu Manickavasagam and Mohan K Kurup. How far can a young girl of class IX dream of herself getting involved in the movie industry? It seems that Harissa thinks beyond time which has landed her in the dream world with a handful of movie in kitty. Asuaravithu was a stepping stone which was followed by cameo roles in Turning Point and Face-to-Face along with Mammootty. Her upcoming movie waiting for release is Jayaram-starrer Ginger in which she is paired opposite to actor Kailash. It was her uncle Niyaz Marakkar, a well known film photographer who introduced Harrissa to tinsel town. With a high interest in modeling, Harissa proved her mettle lending her face for several ad films. She also had kept her foot strong walking through the ramp and kept a close relationship with modeling too. Harissa is currently ongoing the shooting of 'Life', a campus love story. A number of artists who made their acting debut right from the early age had keep their presence alive for several years giving more hope for Harissa. Aval Vannathinu Shesham is expected to travel through a different phase.